Think you know all there is to know about the MiG-25? Check out these facts. 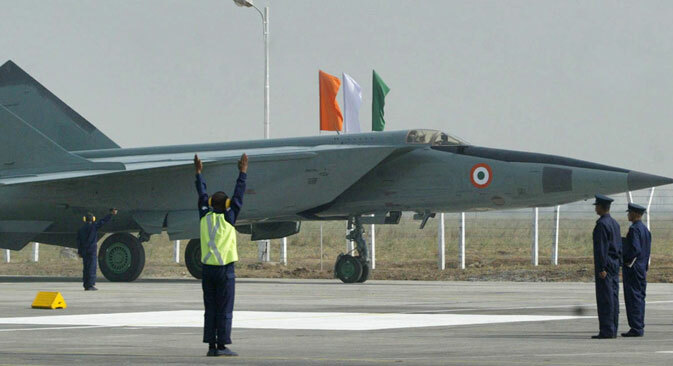 The MiG-25, which first took to the skies 50 years ago has long been a trendsetter in aviation. Here’s what you need to know about this fighter-interceptor, which has served in the air forces of more than 10 countries around the world. The MiG-25 (NATO codename Foxbat) was to have been a response to the perceived threat from the American supersonic B-58 bomber and its upgraded replacements, which were capable of breaking through anti-aircraft defenses and inflicting a nuclear strike. The fighter-interceptors the Soviet Union had at its disposal at that time were not capable of countering these aircraft effectively in terms of speed and altitude performance characteristics. Moreover, they were not able to counter the high-speed Lockheed SR-71 reconnaissance aircraft, which had a cruising speed of Mach 2.8. The MiG-21 and Su-15 fighters then in service had no chance against the XB-70 Valkyrie strategic bomber. The designers of the MiG-25 succeeded in ‘accelerating’ the aircraft to a speed of 1,800 mph and attaining a ceiling of 75,000 feet, which made it comparable with the performance characteristics of the Valkyrie. However the two aircraft types were fated never to face each other, since the Valkyrie did not go into series production. The design of the MiG-25’s airframe had never been seen before in fighter aviation. The aircraft is fitted with square, lateral air intakes with a horizontal intake ramp, a twin tailfin and thin, trapezoidal, low aspect ratio wings. Will the PAK DA outstrip the American B-2? The two engines are located next to the rear fuselage section. This geometry allowed it to accelerate to what for that time were record speeds and to achieve cutting edge maneuverability for an aircraft of its class. The onboard electronics equipment meant that the aircraft could be guided onto a target in a semi-automatic mode for the first time, which was essential given the anticipated closing speeds: the normal human reflexes would not respond quickly enough. 3. It gets really hot! Because it can perform at speeds in excess of Mach 2.5, the aircraft heats up significantly – to temperatures of 570-750°F. Therefore, it was not possible to use traditional materials in manufacturing the MiG-25’s fuselage. One of the options was titanium, which was what the Americans had selected for their plane. However Russian engineers put their faith in steel, which in the end accounted for 80 percent of the total weight of the design. Titanium and heat proof aluminum alloys had to be used for the rest. There were three miles of welded seams in the structure of the airframe and 1,400,000 weld points. The fact that only two insignificant, dripping fuel leaks were discovered in the course of a year of welding, with a total weld length of 270 miles is testimony to the quality of the work. The aircraft’s surprising serviceability was an unexpected, incidental effect of this new material - welding could be carried out on the hard surface itself. The development of the MiG-25 and its test program were carried out in strict secrecy. It was first unveiled to the world on July 9, 1967 in a flypast to mark Air Force Day at Domodedovo airport outside Moscow. Four fighters flew over the stands at low level. The commentator announced that this was a new fighter capable of speeds of 1,800 mph. For the west this was big news, and moreover it was not good news. Extraordinary hearings were held at the U.S. Congress as a result. These hearings supported the start of work on a new class of fighter-interceptor in the F-14 and F-15. Both these aircraft feature a twin tail design, just like the MiG-25, but they fall short in terms of speed and altitude. In September 1976, second lieutenant Viktor Belenko flew a MiG-25P from an airbase in the Far East to Japan, landing on the island of Hokkaido, where he requested political asylum. The aircraft was dismantled and examined by American specialists. It was, however, returned in dismantled form a month and a half later at the request of the Soviet Ministry of Foreign Affairs. The Soviet officer’s defection dealt the Soviet Union a serious blow. At the same time, there was a positive aspect: it paved the way for improving the MiG’s combat effectiveness. All the electronics equipment on the production aircraft were replaced, since the previous system had been examined by a potential enemy. As a result, the fighter was given more modern target location and tracking systems and a new designation - MiG-25PD. The MiG-25 holds 29 world records. Among these is one which is unique, and which has not been beaten even to this day - the altitude record in an aircraft using jet engines. On Aug. 21, 1977, Soviet test pilot Alexander Fedotov climbed to an altitude of 123,523 feet above the Earth.